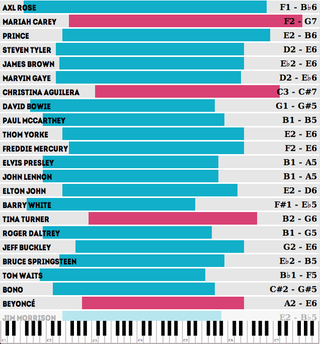 Which Famous Singers Have The Widest Vocal Ranges? Concerthotels.com has put together a neat interactive showcasing the (in-studio) vocal ranges of over 7o famous figures. The top of the list is above. Axl Rose is your surprising victor, but the high notes are the crowd-pleasers, and here, Mariah Carey—with her insane G7—stands alone. The interactive doesn't play the notes, but if you scroll over the performers, you can see the song in which they hit their highs and lows. Read down far enough to find Taylor Swift, narrowly beating out fellow country singer Luke Bryan to avoid the bottom spot.